This Espresso Cups Guide helps you to buy your perfect espresso cups for your ultimate espresso. Are you having an espresso machine and looking for nice cups to serve your espresso? There are so many coffee cups which you can buy – but hard to find the perfect one, it`s really confusing. When I searched for the perfect espresso cups I learned so much about what to consider before buying. In the following you learn more about choosing the right cup to enjoy you perfect coffee. People often think that it doesn`t matter which coffee cup they use for their coffee. But along with different coffee varieties there come suitable cups. Every cup has an influence on the flavor of your daily brew. You spend lots of time and money on the best roast and espresso machine – and put it in a cup that decreases its ultimate flavor? That is not acceptable. Just to make it clear, the cup will not change the taste of your daily espresso completely. It just makes the difference between a plain espresso and the Italian way of espresso coffee brewing. What you should consider before buying espresso cups? If wine lovers have different shaped glasses why shouldn`t coffee lover have different cups for their favorite beverage? The following tips help you to find the best espresso demitasse. Does it allow you to hold it safely? If the handle is to small you cannot hold it tight and it could drop easily. Has it thick sides? This ensures that your coffee is isolated and allows it to remain hot for a long time. Does the cup stands good on the table or saucer? If the bottom is to small and the top to wide it can easily fall to the side if it`s moved. What is the best material for an espresso cup? The most common material for an espresso cup is porcelain. It is thick and heavy to isolate the espresso and very good to handle. See our Full list of Espresso Cups. Lately coffee shops and restaurants serve espresso in shot glasses. This allows seeing the dark color and ‘Crema’ way better. If you buy these glass cups, please ensure that they are suitable for hot drinks. 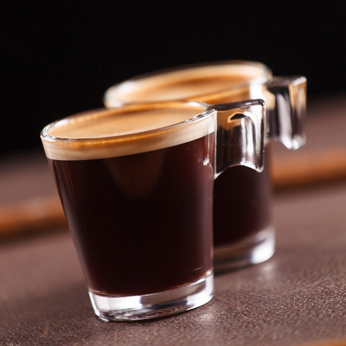 Have a look at my Espresso Shot Glass Guide. What are common espresso cups designs? For many people out there the perfect coffee mug reflects their personality. Coffee mugs are available in all kind of different sizes, forms and colors. My favorite coffee cup has the form of a cow, it just looks funny. But espresso cups should have a rounded bowl shape inside and no angles. What is the best color for an espresso cup? Espresso is mostly served in a plain white porcelain espresso cups, because the white reflects the dark brown color of the espresso nicely. Usually, if the cup has another color on the outside it is white inside. There are many colors out there for espresso cups: Cups can be red, some have an elegant writing and others have adorable prints like flowers. The color of the cup has no influence on the taste – so go ahead and have a look at our Full Espresso Cups List to choose your perfect demitasse. There’s nothing like a fresh cup of coffee to start your morning off right.